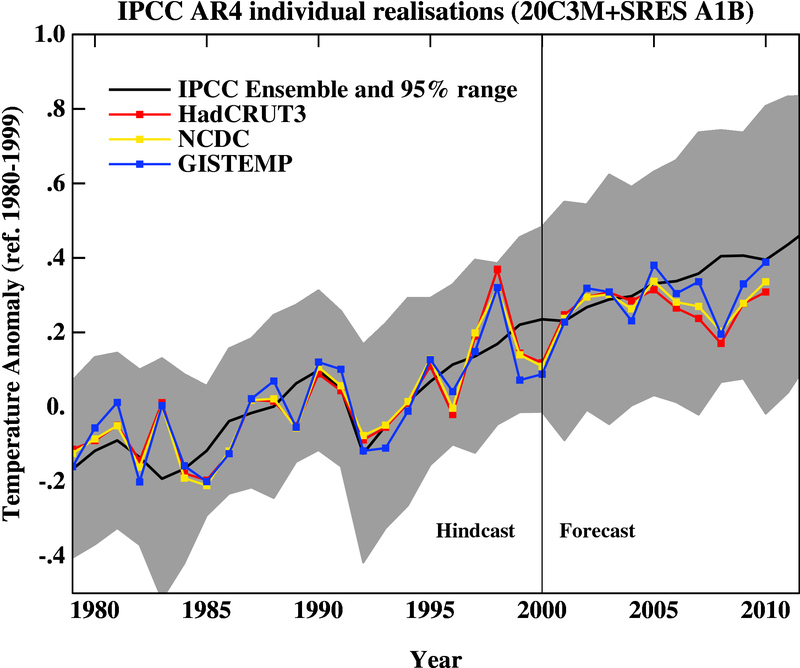 The models are looking pretty good, as shown by this graph from Real Climate. The colored lines are different measurements of change in global temperature average. The black line is the average of the predictions from the models used by IPCC, and the gray band shows the 95% confidence level (only a 1/20 chance of being outside the band). There’s obviously a some significant short-term bouncing-around, but the trend line looks quite good — better than one might expect given all the difficulties involved in modeling something as complex as the planet’s climate. Even putting aside the models, the actual observations leave no doubt that there’s been an upward temperature trend for the past thirty years. It seems you are repeating misinformation from a biased source. Other, unbiased analyses show that the climate models are outside the 90% confidence level for relevance to the actual climate data. A new paper by prominent German climatologists Dr. Hans von Storch and Dr. Eduardo Zorita, et al, finds “that the continued [global] warming stagnation over fifteen years, from 1998 -2012, is no longer consistent with model projections even at the 2% confidence level.” In other words, there is a greater than 98% probability that climate models are unable to explain the stagnation in warming over the past 15+ years. Can climate models explain the recent stagnation in global warming?